For the last few non-podcast-related blog entries, I’ve been discussing Ophelia and her flowers in Hamlet, first their symbolism and then their more practical, medicinal uses. I even raised the possibility of Ophelia being pregnant and that rosemary and rue could have been used for a chemically induced abortion. Why does Ophelia commit suicide? Before we broached the concept of the possible pregnancy, the losses of her father and then Hamlet were the usual suspects. Those make sense and cannot be denied as possibilities; and they do have an impact on any pregnancy-related suicide as well. Any form of protection for Ophelia from society, by either her father or her lover, has been removed. If she is pregnant, when did the conception occur? Well, let’s do some math … the actions of Act Two and Three take place roughly two month after the plot points of Act One. It’s conceivable (pun totally intended) that Hamlet had been back at Elsinore for no more than a month before the events of Act One, since we know that old Hamlet’s death took place about two months before the beginning of the play. As we noted earlier, Polonius has heard that Hamlet and Ophelia have been spending time together–enough time together that Laertes is prompted to speak to Ophelia about the relationship, too–so the earliest the conception could have taken place (remember Hamlet was away at school) is what we’ll call Act One-minus a month. The latest would probably be Act One-plus a month (as by this point his “antic disposition” would have taken over, and their relationship probably devolved quickly. So by the time of Hamlet’s killing of Polonius and enforced departure for England, Ophelia could have been anywhere between one and three months pregnant. But how long has it been between the killing of Polonius and the events of Act Four, Scene Five, when we see Ophelia’s breakdown? It has to be less than two months, as–at the most–that’s the period of time between the death of old Hamlet and the events of Act One, both young Hamlet and Laertes are present for that, and Laertes was away in France when he received both death notices. But I think two months is stretching it (I’m thinking one month, six weeks, tops), but one has to remember that Laertes has been at Elsinore for at least a little while (both before the start of the play [he had come for the “coronation” (I.ii.53)], and this is clearly in the past as he is anxious to return), and here in Act Four, as he has had enough time to attract followers to call for him to “be king” (IV.v.106). So let’s say it’s a total of six weeks between Act Four, Scenes Four and Five. This would make Ophelia anywhere between two and a half, and three and a half months pregnant. By this point, Ophelia would be well aware of her pregnancy, and well aware that she would soon begin to show outward signs of it. Or maybe she is already showing, as Horatio, when attempting to convince Gertrude to grant an audience with Ophelia, uses an interesting phrase: “’Twere good she were spoken with, for she may strew // Dangerous conjectures in ill-breeding minds” (IV.v.14-5). To speak to one could allow for that person to be out in public; to speak with that person connotes bringing them into private, where she might not raise any eyebrows or rumors. Also interesting: Horatio’s use of “breeding” in his sentence; it might very well be a pointed use here. Regardless, Ophelia needs a way out. By the use of rosemary and rue, I’ll argue that she has attempted a chemical abortion, but has not (at least to her knowledge) succeeded. She makes a desperate plea for help: only after knowing that she access to the Queen (in the first half of the scene) does she return to bring her coded flower-message to Gertrude. The message is sent, but is it received? Gertrude certainly doesn’t mention it. Of course, Gertrude says NOTHING from this point in the play until she enters to announce Ophelia’s death two scenes later in this text (as opposed to the “Bad” Quarto’s Gertrude-Horatio letter scene). Her silence here could be tacit acknowledgement of receipt of message, of a secret kept. Is it just me, or is this account far too descriptive to be second-hand? Gertrude’s version of the story contains sensory details of both sight (“clothes spread wide… mermaidlike” [IV.vii.173-4]) and sound (“she chanted snatches of old lauds” [IV.vii.175]) that simply could not exist without first-hand experience. 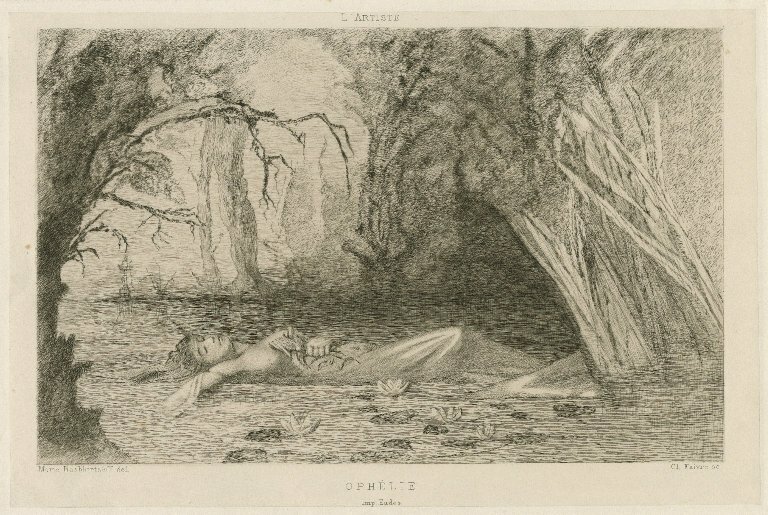 Folger Digital Image Collection: Hamlet, act 4, scene 7, Ophelia [graphic] / painted by R. Westall R.A. ; engraved by Jas. Parker. Gertrude was there, having received Ophelia’s coded cry for help, and had attended to her needs. It’s unclear if this is a poetic spin, a beautified cover story of simple suicide, or a truthful depiction of the event. I’d like to believe it’s the latter, with Ophelia being “incapable of her own distress” (IV.vii.176). A peaceful release of life, rather than a desperate extinguishing of it. 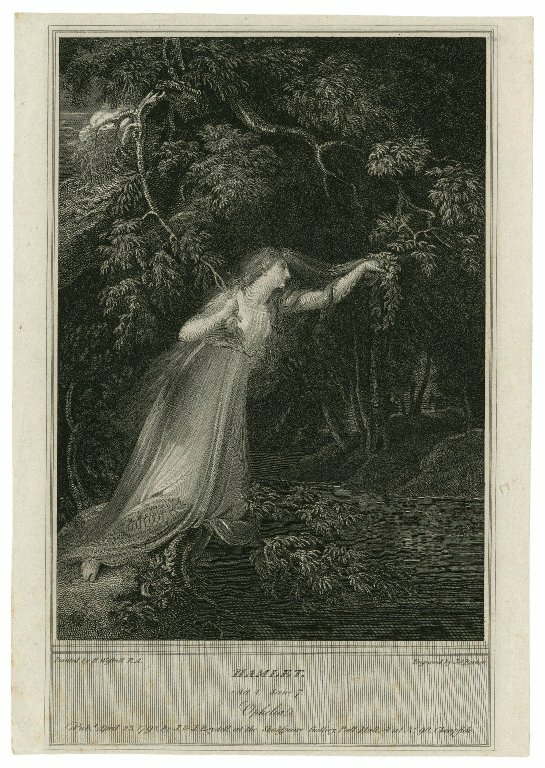 Folger Digital Image Collection: Ophélie [character in Hamlet] [graphic] / Marie Bashkirtfeff del. ; Cl. Faivre sc.